Ahead Of 2020 Runs, Democrats Move To Beef Up Foreign Policy Credentials A key step in running for president: laying out a foreign-policy vision showing he or she can command the military and keep the country safe. Several likely candidates are hard at work on this front. Both Democratic Sens. Bernie Sanders of Vermont and Elizabeth Warren of Massachusetts have already given major foreign-policy addresses ahead of possible presidential runs in 2020. "Today, we tell the despotic regime in Saudi Arabia that we will not be part of their military adventurism," said Sanders, a co-sponsor of the resolution, from the well of the Senate shortly before its passage. In addition to taking a leading role in the first-ever Senate vote on Congress' power to end military actions, Sanders has delivered multiple big-picture speeches on foreign policy over the past two years. And he isn't alone among potential 2020 Democratic hopefuls in beefing up their foreign-policy or national-security credentials. Massachusetts Sen. Elizabeth Warren of Massachusetts recently gave her own major speech spelling out her foreign-policy vision. Others are likely to follow with speeches, policy papers and analyses in places like Foreign Policy. And lawmakers are sure to try and get on or remain on key committees that help shore up those qualifications — Sen. Cory Booker of New Jersey is a member of the Foreign Relations Committee, California Sen. Kamala Harris sits on Intelligence and Homeland Security, Sen. Sherrod Brown of Ohio is on Veterans Affairs, and New York Sen. Kirsten Gillibrand, as well as Warren, is on Armed Services. Foreign policy is a threshold issue in presidential elections. It might not always command the attention that the economy can, but Americans need to feel assured that the person leading the country can keep them safe, command the military and make sound decisions in the world. Every so often, it can emerge as a hot-button issue in a primary. In 2004 and 2008 as the Iraq War raged, Democratic candidates all tried to out-do each other as the most anti-war candidate. "I don't think that Barack Obama would be elected president or would have become the Democratic nominee without his opposition to the Iraq War," said Ben Rhodes, one of Obama's top foreign policy advisers dating back to the early days of Obama's campaign and into his presidency. "I think people forget in the primary he and Hillary had very few differences." In most races, however, foreign policy tends to take a back seat. "A candidate will essentially try to clear a bar," Rhodes noted, "do enough to show that they have either the ideas or the qualifications or the experience to be commander in chief." Rhodes wrote in a recent memoir, The World As It Is, that even with so many Democratic voters focused on Iraq, he often felt like one of the only people on the Obama campaign even thinking about foreign policy. 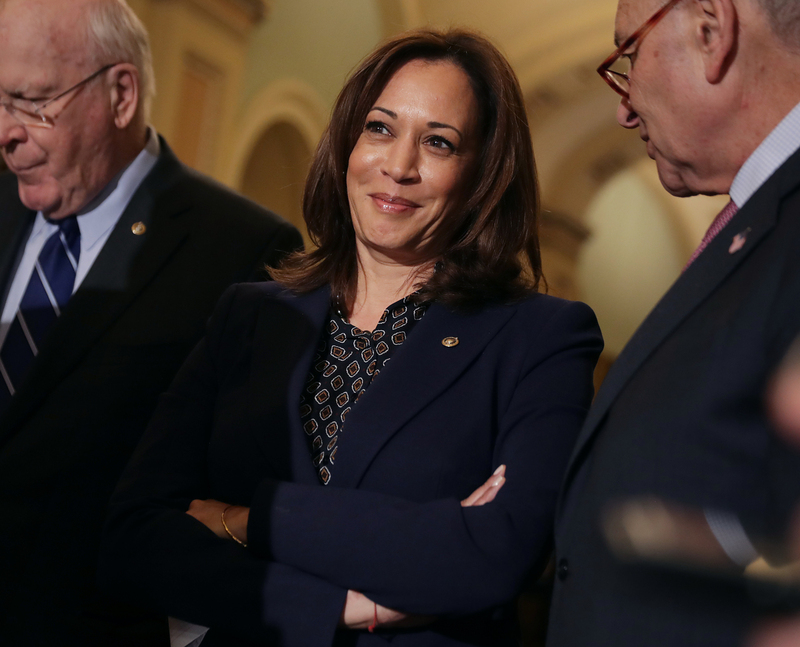 Sen. Kamala Harris of California is among several likely Democratic presidential candidates. The main candidate goals, Rhodes said, are often "to not make mistakes in debates. To potentially draw some contrast with other candidates but not really devote a lot of time." For candidates running from the Senate, most of that "box-checking" happens in committee. That's why committee assignments are so important. Candidates try to make the most of high-profile hearings, like when Booker needled Mike Pompeo on human rights and freedom of the press during the Secretary of State's confirmation hearing. Overseas trips also help brandish those reputations, as well. Harris made a trip to Afghanistan just this week and has previously visited Iraq. 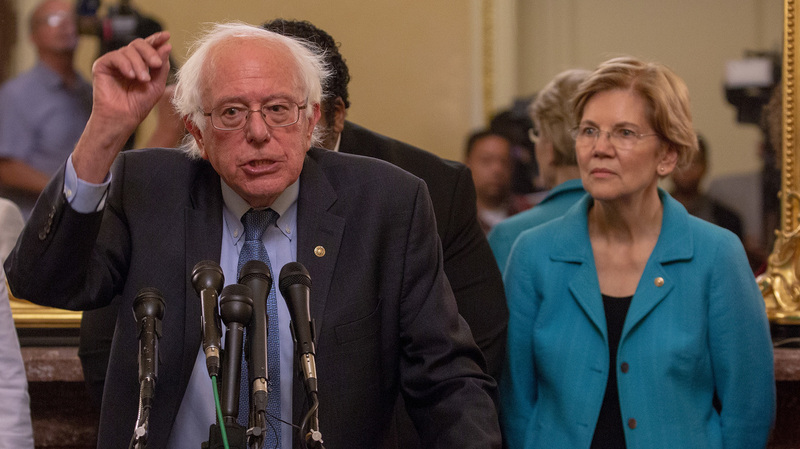 Broad, big-picture speeches on foreign policy are a mainstay of presidential campaigns, so it's notable that the first two likely Democratic candidates to deliver them are senators known more for their domestic agendas — Sanders and Warren. "As with other elements of the Democratic Party," Rhodes said, "the more progressive wing of the party is beginning to frame the terms of the debate." Both Sanders and Warren made a point in their speeches of linking foreign policy back to the hearts of their agendas: income inequality. "Foreign policy is not just tied to military affairs. It is directly connected to economics," Sanders said last year in a speech at Westminster College. "Foreign policy must also take into account the outrageous income and wealth inequality that exists globally and in our own country." Sen. Cory Booker of New Jersey addresses a crowd in New Hampshire, which happens to be a key early presidential primary state. Warren struck a similar note last month at American University. "We need to end the fiction that our domestic and our foreign policy are somehow separate from each other," she said, "and recognize that policies that undermine working families in this country also erode America's strength in the world." Both progressives attempted to thread the needle between a broad, America-As-World-Police approach to international politics, and President Trump's isolationist views. "The goal is not for the United States to dominate the world," Sanders said last year. "Nor, on the other hand, is our goal to withdraw from the international community and shirk our responsibilities under the banner of 'America First.' Our goal should be global engagement based on partnership, rather than dominance. This is better for our security, better for global stability and better for facilitating the international cooperation necessary to meet shared challenges." Warren called for a full withdrawal of American troops from Afghanistan, a policy of never using nuclear weapons first, and slashing the military's budget. "If more money for the Pentagon could solve our security challenges, we would have solved them by now," she said. So far, Rhodes doesn't see any campaign issue rising to the level of the Iraq War with either Democratic voters or the presidential candidates. Neither does longtime Pentagon official Michele Flournoy, who's viewed as a possible future Secretary of Defense the next time a Democrat wins the White House. Trump's treaty-busting, alliance-rattling "America First" approach has energized his supporters. Trump and his base see victory after victory, as he walks away from the Paris Climate Accord, the Iran nuclear deal and other international coalitions and agreements. 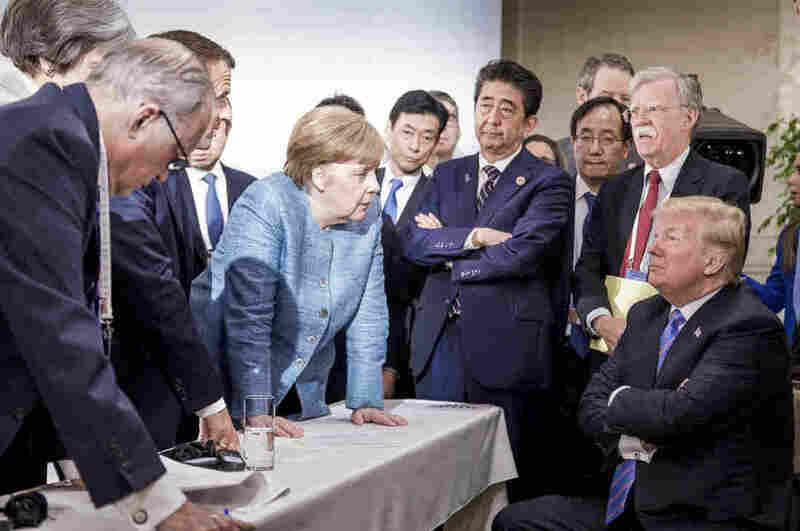 German Chancellor Angela Merkel, center, speaks with President Trump while surrounded by other world leaders during the G7 Leaders Summit in La Malbaie, Quebec, Canada in June. To Flournoy, however, Trump's track record is "so outside the norm of presidential conduct on foreign policy that the biggest contrast will be between any [general election] candidate and him, as opposed to between the [Democrats]." Flournoy is hoping the eventual Democratic winner makes a pitch along these lines to 2020 voters: "America's interests and values are not well-served when we try to go it alone or impose our will through threats and intimidation. Our strength is when we build coalitions and alliances of like-minded states who share interests, or sometimes values, and we go after problems together." 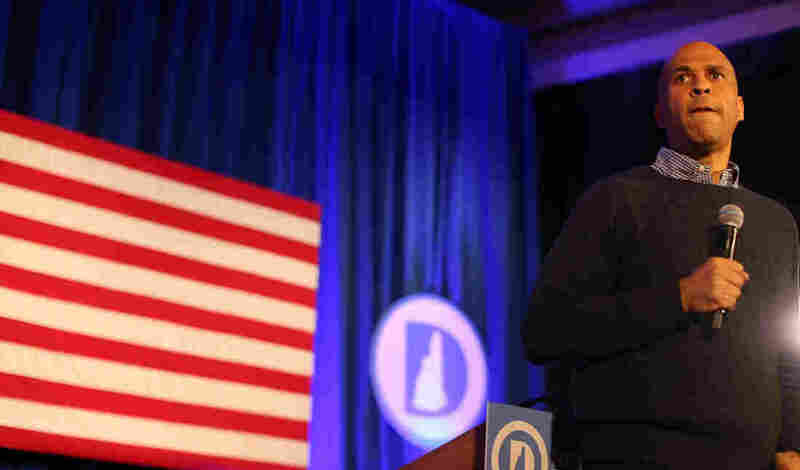 With the Iowa caucuses more than a year away, and the 2020 general election even further, there's a lot of time for new crises to spring up and become top-tier campaign issues. But even if foreign policy remains on the back-burner, Flournoy cautions presidential hopefuls to pay attention. "Whoever is the next president," she warned, "they are going to inherit a very messy but consequential international situation that they have to spend time on and have to have some sense of direction." And if one of the Democratic contenders can defeat Trump, she or he will likely spend a good deal of time making nice with other heads of state. "I think the rest of the world has looked at this and not just reacted to Trump being president," Rhodes said. "They've reacted to the fact that our country elected Trump, right? And the stability that people could count on the United States is suddenly gone."